Ethel: Oh, I don't think those Italian actresses are so much. Not one of them has got her hair combed. Fred: Well, they look great to me. Ethel: If I let my hair go like that, you'd never let me hear the end of it. Fred: Honeybunch, if the rest of you looked like that, I wouldn't care if you were bald. When I Love Lucy packed its characters off to Hollywood in Season Four to allow Ricky (Desi Arnaz) to pursue a movie career, the plotline shift sparked a creative renaissance for the show's writers�so much so that the story arc chronicling the madcap misadventures of Lucy (Lucille Ball) and Ricky in Tinseltown carried over into the series' fifth season. Yet despite the plethora of fresh ideas and bottomless well of guest stars the California locale provided, everyone associated with I Love Lucy knew the Ricardos and Mertzes couldn't stay in Hollywood forever. Eventually, they had to return to their normal lives in New York. Or did they? Hey, if a cross-country trek could revitalize the show, just think what a trans-Atlantic junket could do! Writers Bob Carroll, Jr., Madelyn Pugh, Jess Oppenheimer, and newcomers Bob Schiller and Bob Weiskopf eagerly took the bait, and after giving Lucy, Ricky, Fred (William Frawley), and Ethel (Vivian Vance) barely enough time to unpack their bags, catch their collective breath, and settle back into their Big Apple brownstone, they shuttled the comic quartet off to Europe for more wacky fun. Long before National Lampoon's European Vacation gave American tourists a bad name, the Ricardos and Mertzes took the continent by storm, and in this four-disc, 26-episode collection, they spread their patented brand of loony mayhem across England, France, and Italy. The premise? Ricky's agent books the bandleader's Club Tropicana orchestra on a three-week European tour, but the hefty price tag makes it impossible for Ricky to take Lucy along. The tour, however, needs a manager, and when Ricky offers Fred the job, Lucy and Ethel decide to hold a raffle to raise money for their share of the trip. They hoodwink a neighborhood appliance dealer into donating a fancy television set, and dream up a bogus organization called Ladies Overseas Aid as the beneficiary. After all, Lucy reasons, "We're ladies, we want to go overseas, and boy, do we need aid!" All goes swimmingly until the local D.A. gets wind of the scam and threatens Lucy with prosecution if she doesn't stop the illegal drawing. More complications ensue before the girls slither out of trouble, and Ricky finds a way to afford their European transit. Once the gang clears that hurdle, the race is on to apply for passports (complicated by Lucy's inability to locate her birth certificate), cure Fred's seasickness (complicated by Lucy overdosing on Dramamine), and, in one of the series' funniest and most frenetic episodes, get Lucy on board the S.S. Constitution after a snagged hemline on a bicycle spoke makes her literally miss the boat! Watching Lucy frantically run around in her slip, charter a helicopter, and be lowered onto the ship's deck reminds us how imaginative the star's writers could be, and how Ball would go to practically any length for a laugh. Arriving on European terra firma, of course, doesn't put an end to Lucy's hilarious string of calamities. Before the Ricardos and Mertzes board the flight home (with our favorite redhead swaddling a 25-pound block of smuggled Italian cheese like an infant), Lucy cavorts with her McGillicuddy relatives in Scotland, schemes to meet dreamy French actor Charles Boyer, models a "Paris original"�made from a potato sack, no less!�from designer Jacques Marcel, causes an Alpine avalanche, tangles with customs officials when she misplaces her passport on a bike trip, and breaks the bank at Monte Carlo after cavalierly tossing a stray chip onto a roulette table. Yet even those indelible screwball escapades can't hold a candle to Lucy's knock-down-drag-out fight-to-the-finish with a blowzy Italian grape-stomper who refuses to let a dead-tired Lucy cool her heels. The two women give the term "food fight" new meaning, while at the same time spawn the sport of female mud-wrestling as they roll around in a sea of crushed grapes. Only Lucy's Vitameatavegamin commercial and disastrous stint as a candy-wrapper can top this classic slapstick sequence. Through all this bedlam, Lucy's talent reigns supreme. Sure, she's the world's preeminent physical comedienne, but Ball also possesses impeccable timing, peerless facial expressions, and a knack for delivering joke-filled dialogue in a natural, engaging manner. By this point in the series, the chemistry between the four lead actors is so tight, the show happily chugs along like a well-oiled machine, with pistons firing on all cylinders in every episode. Add consistently strong writing and inspired situations (a spoof of Edward R. Murrow's popular interview program, Person to Person, works especially well), and Season Five unequivocally becomes I Love Lucy's finest. Image Transfer Review: Paramount continues its meticulous treatment of I Love Lucy with perhaps its most breathtaking transfer of the series to date. The black-and-white episodes crackle with eye-popping clarity, exceptional contrast, and terrific gray level variance, all of which make the familiar plots and slapstick routines feel surprisingly fresh and immediate. Blacks are rich and solid, and close-ups possess a vibrant lushness that creates a newfound intimacy between the viewer and Lucy's gang. On occasion, slight shimmering can be detected, but all scratches, marks, and traces of grit have been carefully removed. An absolutely outstanding effort from Paramount. Audio Transfer Review: The mono audio also has been scrubbed clean, and sounds less tinny and shrill than in previous seasons. Maybe television recording techniques had improved by 1955, but whatever the reason, dialogue is always clear and easy to understand, and Arnaz's musical numbers enjoy fine fidelity. Spanish language tracks are available on many�but not all�episodes. Extras Review: This I Love Lucy set contains all the same supplement categories as previous seasons�flubs, lost scenes, restored music, original series openings and animated sequences, as well as highly informative and comprehensive guest cast biographies. 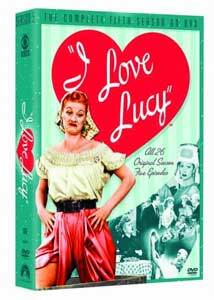 Audio-only extras include five complete episodes of My Favorite Husband, Lucy's popular radio series that inspired I Love Lucy; another excerpt from Jess Oppenheimer's memoir, Laughs, Luck�and Lucy!, read by Larry Dobkin; and�exclusive to this set�a brief interview with Oppenheimer, in which the talented writer-producer talks about how Lucy threw herself into work to escape her "very unhappy home life" with Arnaz, and how she needed to be dominated by a strong man on the set. Oppenheimer also marvels that I Love Lucy "ever got on the air at all," considering no one involved with the project had any prior television experience. Multimedia production notes once again prove quite interesting, combining clips from various shows, script excerpts, and photos with narrative text. Did you know FBI director J. Edgar Hoover once sent Lucy a fan letter after the broadcast of The Great Train Robbery episode? A facsimile of the actual telegram is included, and helps bring the tough, mythic Hoover a bit closer to earth. Finally, a photo gallery featuring 15 black-and-white and four color images offers a rare behind-the-scenes glimpse of backstage life on the I Love Lucy set. Armchair travelers will especially enjoy the rollicking fifth season of I Love Lucy, as the Ricardos jet-set from Hollywood to Europe, and turn the continent on its ear. As always, Lucy and company pack plenty of daffy schemes and clever one-liners in their suitcases, and their uproarious travelogue contains some of the series' finest episodes. Paramount outdoes itself with crystal clear transfers, excellent audio, and a cavalcade of quality supplements, making the purchase of this four-disc set a must. If you only buy one season of I Love Lucy, this is the collection to own. Highly recommended.